Community Art for a Vision for the Future! There is no doubt you have heard about the fight for living wages by now, as protests sweep across the country to raise the minimum wage to $15 per hour. It seems like a no-brainer to those of us who have ever struggled to make ends meet, or even those of us who have witnessed the rising costs of living, especially in the metropolis of Los Angeles. Not to mention the lack of time-off, wage theft enforcement, and guaranteed sick days, as if these are all optional human considerations in this day and age. 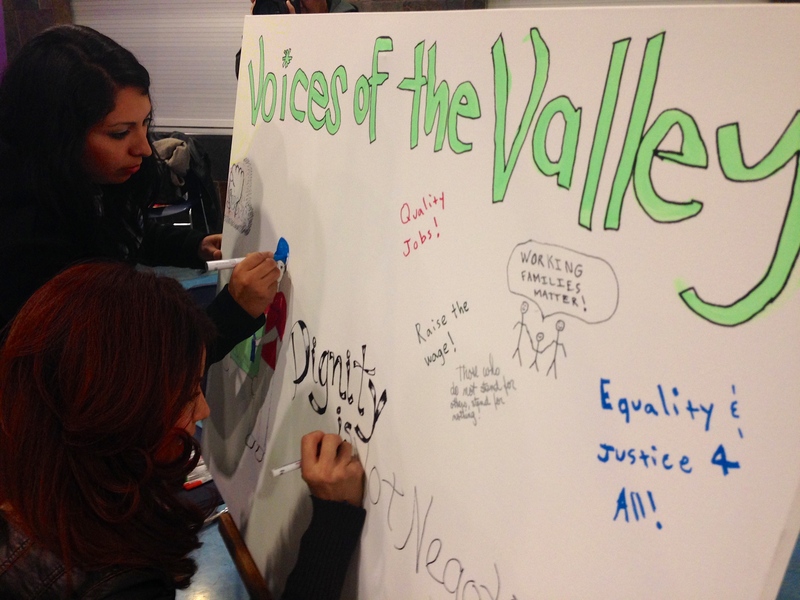 Last week, Voices from the Valley and Well LA organized a story sharing of individuals who have witnessed firsthand the devastating impact of today’s working conditions. Ingela Dahlgren, SEIU Nurse Alliance of California’s Executive Director, was among the panel of participants who shared particularly moving and uniting stories that had everyone ready to protest and stand up for their rights by the end. 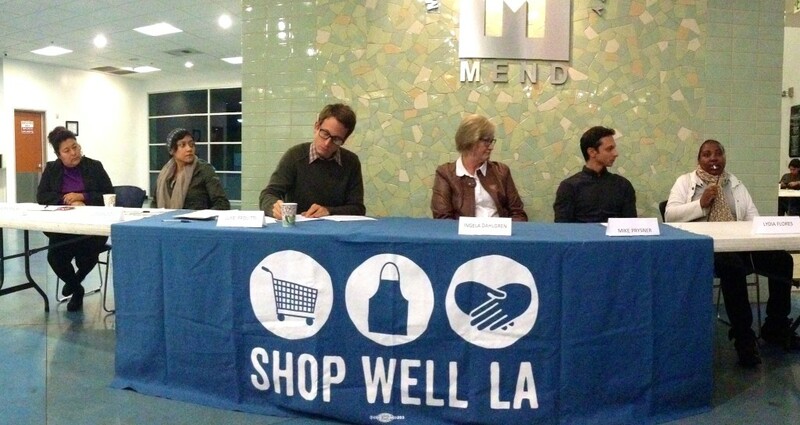 The gathering was hosted at MEND Center for Poverty in Pacoima, CA, a lean nonprofit dedicated to providing food, clothing, healthcare, job services, and more to help break the bonds of poverty and create a self-reliant, caring community in the San Fernando Valley (SFV). Lydia Flores is a single mother of an Autistic child and works as a Cashier at Smart & Final. Her work provides no sick days and she struggles with taking her child to the hospital yet also having enough to pay the bills. A mother shouldn’t have to chose between her child and surviving, especially when working full-time. This needs to change. Mike Prysner is a recent veteran who was unable to find a job after coming home from service despite his best efforts. This is due to the lack of transition we have for our veterans in translating their combat skills to today’s world. Veterans are twice as likely to be unemployed, and 20% of those unemployed in this country are actually female veterans. This should not be the case for our hardworking brothers and sisters who come back after service to this country. This should be recognized. Ingela Dahlgren had a few stories to share about the cases she has witnessed as a nurse, such as seeing four little girls come in progressively ill from a cold transforming into bronchitis and infections simply because their father and mother were unable to take any days off without risking being laid off. Another gentlemen lost his foot from progressive development of diabetes because he was unable to take off his work to get it checked out. The tragedy is that his right foot was his source of livelihood for controlling the forklift. She also spoke of her co-worker Rosa, who continually had to come in sick because her contracting company did not allow paid sick leave. It is unacceptable for any individual to disregard health issues for themselves or their family because their employers refuse to recognize the importance of personal safety and health. This is a grave disregard. 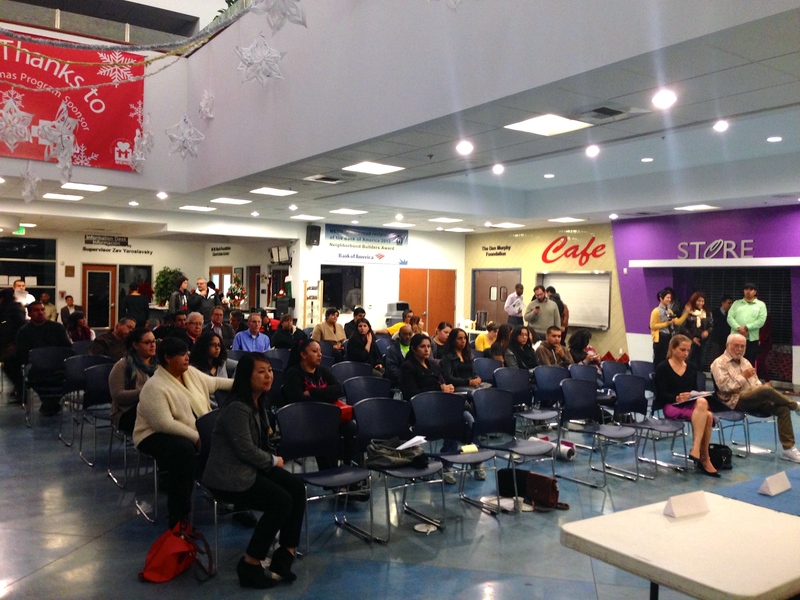 Lupe Galindo had a particularly emotional testimony as a student who was born and raised in SFV. She comes from a family who has struggled and her father was a victim of wage theft, the illegal withholding of wages or benefits that are rightfully owed. She told us all that, “I know there are families everyday who attend to others but cannot attend to themselves or their own family.” This is injustice. Laura Macias had much to say in Spanish that was fortunately translated for all of us to understand, including her two children proudly listening in. She currently works at two separate McDonalds despite their poor treatment and stressful work environment. She has lived in Pacoima for 10 years and recalled that before moving there, all she heard about were how many problems there were in Pacoima, but that this wasn’t true in actuality. Their local high school graduation rate happens to be over 99%, one of the highest in the nation, with 95% going on to college, a true example of what community service and goodwill can accomplish. One day, when Laura asked her employer if she could leave her shift early to take her sick son to see the doctor, she was coldly told she would have to let them know a month in advance. Despite being an upstanding employee, her management retaliated by lowering her hours and not providing a single raise for three years. When the minimum wage was finally raised in 2009, her wage received only a .05 cent increase to match. Despite her calm poise at sharing this event, the shock and fury of the crowd was palpable . This cruel behavior should never be tolerated in the workplace and these corporations should be held accountable for their inhumane attitudes towards the employees who make their success possible. This will change. By the end, we were all in agreement that this is our time to speak powerfully and that we should be proud to share our stories, never ashamed. Indeed, it is our right to live a good life, to be able to spend time with our families, and live stress free. As a union of California nurses, we are committed to standing up for the rights of all individuals and protecting their health and safety, including raising the minimum wage to provide relief to those who may be suffering. There is a shift developing; locally, nationally, and globally. This is just the beginning. Check out RaisetheMinimumWage.com, a project of the National Employment Law Project, for more facts, media, and campaign resources. Last week saw manifold acts of courage, solidarity, unity, and peace, centered in the heart of Los Angeles. The border crisis is not something limited to one group of people, or even a marginalized percentage of the population. It is something that affects us all, a global issue and serious question of what “borders” (literal and otherwise) divide us as humans. As Nurse Alliance of California, we are allied in not only our voice for nurses but also for the public health and safety of all. Aside from politics, we recognize that the growing influx of children from Central America risking their lives to make the journey to safety only to be held at detention centers awaiting an unknown fate, not to mention the growing number of undocumented children who must live in silence without security, without access, and without a home, is a humanitarian crises. This past week, eight youth between 15-22 pledged to fast for those children, whose voice and story we all too often never hear. 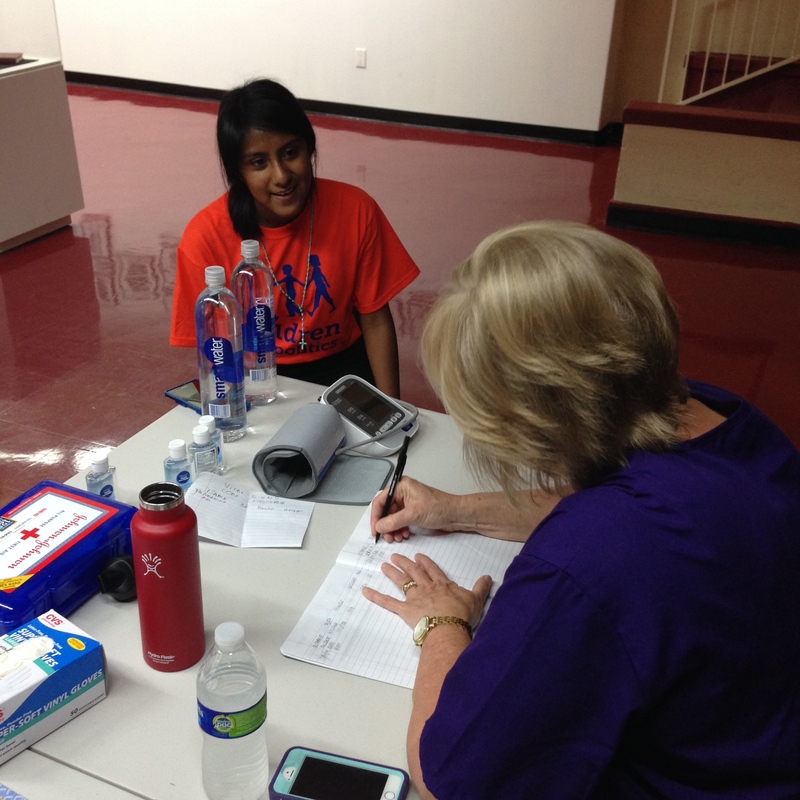 They were joined in support by SEIU, and were monitored by SEIU nurses to ensure their health during the weeklong fast. They were also joined by local groups, musicians, faith and labor leaders, and the general public, some of whom participated in one-day fasts across the country. With over 20 news stations interviewing the fasters and covering the fast; they are hoping this visible sacrifice will show the urgency for action on this issue by administration through policy reform. Coinciding with the fast, President Obama has been meeting with the Presidents of Honduras, El Salvador, and Guatemala and is working towards change on this issue (see The New York Times). Time is too short to allow these children to continue to live in an uncertain future. Let us grant safety to these refugees and work towards establishing everlasting peace across borders. The core fasters fasting for the week, staying overnight at the church on the first day of the fast. Donate online at FastingForChildren.org. 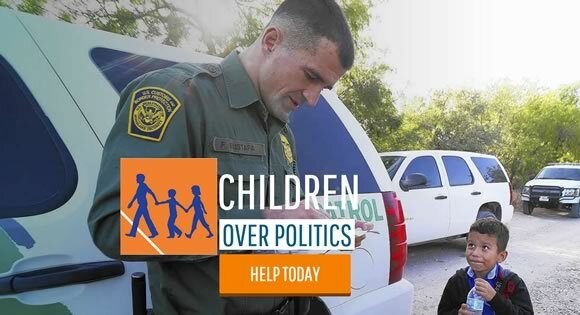 All donations will go directly to help immigrant children at the border. 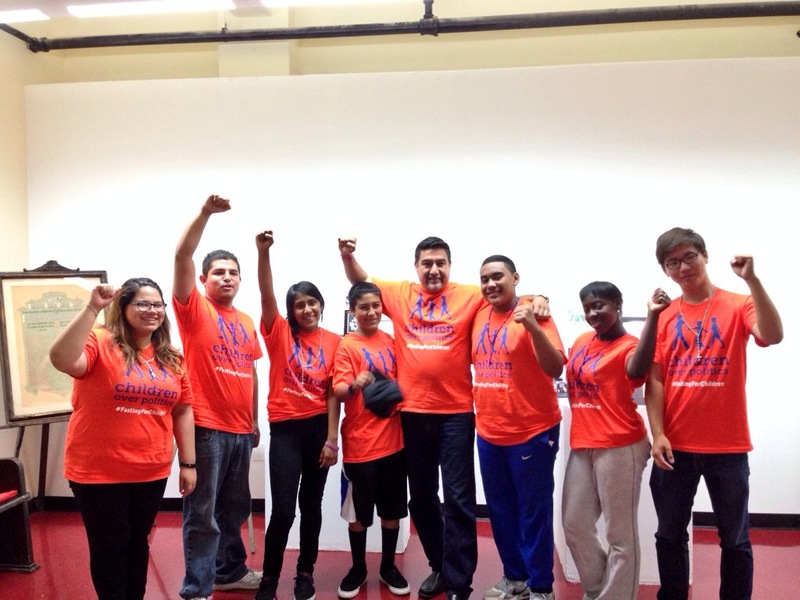 Follow the fasters at @KidsOvrPolitics and tweet your support using the hashtag #FastingForChildren.